One of the many fantastic things about Vietnam is that you can have just about anything you want, whenever you decide you want it, and without breaking the bank. You want to be on that flight to Saigon that leaves in 2 hours? No problem! That will be less than $100, please. You want to book a weekend-long trek in the mountains starting with that overnight train that leaves this evening? Done! You want fries with that? Already on the table. You want 5 high-quality custom-tailored pieces of clothing made in 3 days for much less than you would pay off-the-rack? You got it! This is Vietnam, where all your last-minute dreams can come true! The lovely colonial town of Hoi An (which was lucky enough not to be utterly destroyed in the Vietnam War) boasts an enormous number of tailors, something for which the town has become rather well known. 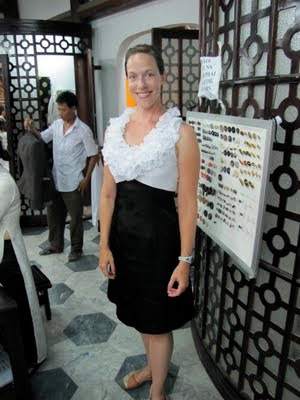 In general, the tailors are supposed to be very skilled, and they can pump out suits and other custom-made pieces in two or three days. That being said, any customer at a tailor shop here has to be knowledgable about good tailoring and needs to chose a tailor carefully and then watch the workers like a hawk. Some tailors are definitely better than others, and most have a reputation for cutting corners if not closely monitored. They will single-stitch hems, leave out linings and pipings, use crappy zippers, or maybe they'll just forget to sew in pockets altogether... Hey, it's not their fault if you don't catch all this stuff. You don't sign a contract with the tailor agreeing to such terms! 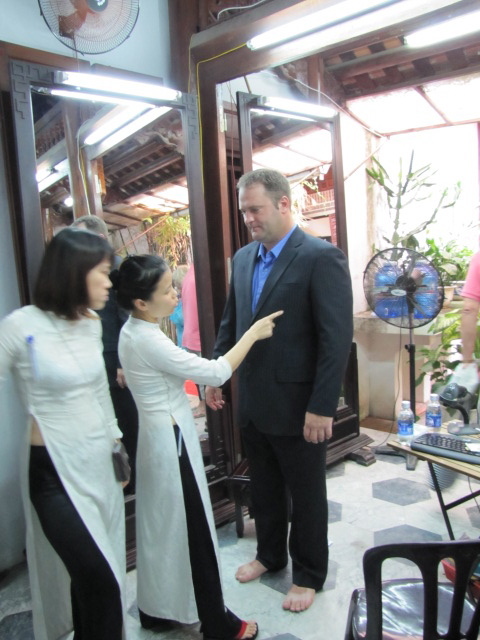 Getting suits custom-made was very high on Dan's list of things to do in Vietnam. I admit, sometimes the guy puts his Good Idea Jeans on. I was more than happy to go along with this and, you know, maybe get a thing (or five) made for myself. Going into this process, we were both very aware of the tendency of the tailors to cut corners. We sought out recommendations from friends, guidebooks, even our hotel in Hoi An, and one name stood out far above the rest - Yaly. They have the reputation for being the best tailor in Vietnam, albeit also the most expensive. But you get what you pay for, right? Right. So off to Yaly we went. 3. Get measured. And by get measured, I mean let some Vietnamese chick record every single conceivable length, width, and/or circumference on your body. 4. Sweat more, use more refreshing towels and chug a bottle of water. 5. Pick out fabric for each piece. Try not to freak out over the task after realizing the sheer amount of fabrics they have to choose from. 6. Pay 50% deposit on your order. 7. Leave puddle of sweat on the floor by the cashier. 1. Return for the first fitting. 2. Try not to sweat profusely as you try on your gorgeous clothing. 4. Let salesperson go over each piece with a fine-toothed comb, marking up each one with a piece of chalk for taking in, letting out, straightening, etc. 5. Notice the lack of cutting corners (good zippers, double-stitching, etc.) as you peel clothing off your sweat-soaked self. 6. Leave happy and go have a beer. 1. Return for second fitting. 2. Try not to sweat profusely as you try on your improved gorgeous clothing. 3. Fail at #2. Again. 4. Let salesperson mark up clothing with chalk again. 6. Sweat like you've never sweated in your life and use more refreshing towels. 7. 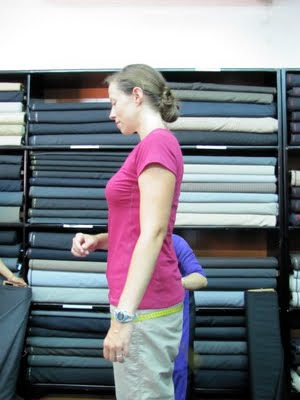 Repeat #5 for each piece of clothing, because there is a separate tailor for each piece. Seriously. 10. Try not to sweat profusely as you try on your 99% finished clothing. 11. Fail more miserably than ever at #10 and pray that the salespeople and seamstresses aren't completely grossed out. 12. Give final approval to pieces that are done (yay! ), get last-minute frantic tweaks done right in front of your face to those that aren't quite done. 13. Watch pantsuit seamstress get really frustrated because the right pant pocket refuses to lie flat. 14. Thank pantsuit seamstress profusely when she finally does get said pocket to lie flat. 16. Pay remainder of bill as salespeople pack up your goods. 17. Profess huge thanks to salespeople! 18. Rush to hotel, pack newly made clothing in backpacks in record time because a taxi is coming in 10 minutes to take you to the airport to fly to Saigon. So there you have it. Vietnam: THE place to get fabulous custom-made clothing in less than 72 hours! WOW! I want to go shopping with you in Vietnam. Love the dress, you look great ever with dripping sweat. Hi Betsy! Of course it's ok - as long as I'm allowed to stalk you back!